Homestead in Ignalina region "Homestead Sakarva"
We invite you to visit our Rural tourism homestead! 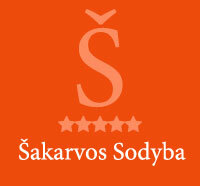 Cozy rural tourism homestead is located on the shore of a beautiful and clean lake Sakarva. We work all year round. A comfortable homestead has all the amenities: on each floor are separate kitchen, lounge with view of Sakarva lake. In the yard - summerhouses, grills, volleyball, basketball, children’s playground. You will be able to rent sauna, hot tub, boat, bike or order other entertainment. In this homestead can rest comfortably 14 people. There you will find all the necessary dishes, grills, electric stove, refrigerator, microwave, dishwasher, washing machine, television, satellite TV. Due an exact prices please ask by e-mail aurius90@hotmail.com or telephone. Arrival 15 h, departure 12 h.
When booking it is necessary to sign a contract and pay advance payment 30% of the total sum.